Duncan Stewart was offered back the driving job he took on last winter to earn around £250 per week as he prepared to partner Russell Knox in the £6.45 million World Cup of Golf in Melbourne. Even some golf people, in truth, might be surprised to turn on their television sets later this week and see Stewart teaming up with Knox as they bid to become just the second Scottish duo after Colin Montgomerie and Marc Warren, the 2007 winners, to sit on top of the golfing world. The pairing, however, is easily explained. As the top-ranked Scottish player, Knox had the luxury of picking his partner from inside the world’s top 500. He turned to Stewart for a number of reasons. The pair grew up 30 miles apart in the Highlands before spending four years as team-mates at Jacksonville University. Their careers had then gone in wildly different directions until Stewart catapulted himself up the world rankings with a Challenge Tour victory in Madrid earlier this year. That was really the catalyst for Knox picking Stewart over either Richie Ramsay or Martin Laird, for example, and the world No 18 is comfortable with his decision. “I definitely didn’t pick him because he’s my best friend,” said Knox, speaking as he sat alongside Stewart at a pre-event press conference. “Obviously he is, but he has earned his right to be here. He’s had an unbelievable year. He’s earned his way on to the European Tour through the Challenge Tour, he won a tournament. 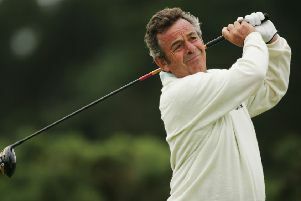 Other than myself and probably Colin Montgomerie, he’s the only other Scot to have won a tournament, which is massive. I mean, if people complain about the format of the pick, I could pick anyone in the top 500 in the world and I did. I don’t really care what other people think. Stewart is delighted that, technically, he’ll tee up in the 72-hole stroke-play event – the first and third days are foursomes with fourballs on the second and last days – as a European Tour player after recently graduating from the Challenge Tour by finishing 10th in the Road to Oman. “That was a massive thing in my mind,” admitted the Grantown-on-Spey man who now lives in Edinburgh and is attached to Turnhouse. “Everyone has their opinion and that’s always going to be the case. When it comes down to it, I think the majority of the people will be behind us. “We’re not the only country that’s done something like this. Jhonattan Vegas has picked his brother while Victor Dubuisson has picked Romain Langasque, so five European Tour guys missed out there. We’re not the only country. It’s the way the rules are. With even the last team assured of a share of $50,000, it’s certainly going to be more lucrative for Stewart than driving a van.